The big screen documentary Lenny Cook tries to make excuses for the failed attempt by Lenny Cook to make it in the big leagues. Excuse after excuse is given for his failed attempt to succeed. 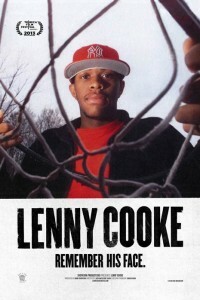 The filmmakers actually say this: In 2001, Lenny Cooke was the most hyped high school basketball player in the country, ranked above future greats LeBron James, Ama’e Stoudemire and Carmelo Anthony. In an era when high school stars were forgoing college hoops in favor of the potential multi-million dollar contracts promised in the NBA draft, Lenny was supposed to be the next superstar. He had the world at his fingertips. But over a decade later, while his peers are taking home MVP awards and championship trophies, Lenny has never played a minute in the NBA. What went wrong? Maybe the fact that he is a complete F-up, plain and simple, and the other players are not, and are actually responsible, to the degree, at least, that they are successful, is the answer.